The United States has expanded its offer of rewards for information on leading figures with the groups conducting terrorist attacks in the Sahel and other areas of North Africa. Mokhatar Belmokhtar is the founder and leader of the Khaled Abu al-Abbas Brigade, also known as the Signed in Blood Battalion. Under his command in January of this year it conducted a deadly attack on a gas facility in al-Amenas, Algeria. At least 37 hostages including four Americans were killed in the attack. Previously, he served in the Algerian army and later was a senior commander in al-Qaida in the Islamic Maghreb, taking part in numerous terrorist attacks and kidnappings of Westerners. In June 2004, a tribunal in Algeria sentenced him in absentia to death for forming terrorist groups, robbery and use of illegal weapons. He has also been sanctioned by U.S. Department of Treasury and the United Nations. 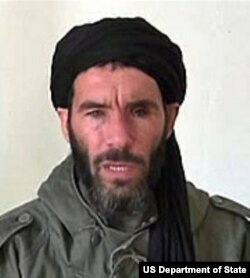 Belmokhtar was born June 1, 1972, in Ghardaia, Algeria. He has black hair and is blind in one eye. He has used the aliases Abou al-Abbas and Mister Marlboro. The Rewards for Justice Program is offering a reward of up to five million dollars for information leading to Belmokhtar’s location. The U.S. promises that all credible reports will be investigated and the identity of all informants will be kept confidential. If appropriate, the U.S. is prepared to protect informants by relocating them and their families. If you have information on this man, contact the nearest U.S. Embassy or Consulate and the tip line at www.rewardsforjustice.net or e-mail information to RFJ@state.gov. Anncr: That was an international public service announcement by the United States Government.